Six weeks after the polls closed, the race for the Otaka vacancy in the 9th Subcircuit is finally over. In an article appearing on the Evanston Review website, Bob Seidenberg reports that Abbey Fishman Romanek has dropped her bid for a full recount in that race. Judge Geary W. Kull, who currently holds the countywide Dolan vacancy pursuant to Supreme Court appointment, has been declared the winner in the race for the 9th Subcircuit seat. The margin of victory was only 48 votes. Seidenberg writes that Kull "won even though two local political heavyweights, U.S. Rep. Jan Schakowsky, D-9th, and State Sen. Jeff Schoenberg, D-9th, backed Fishman Romanek, an attorney for 22 years and a past contributor to Schakowsky and other progressive Democratic candidates." 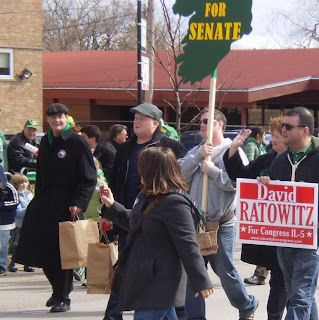 Fishman Romanek was also supported by the 49th Ward Organization in Chicago. For her part, according to Seidenberg's article, Fishman Romanek "stressed that her challenge was not based on any animosity toward" Judge Kull. Seidenberg quotes Fishman Romanek as professing great respect for Judge Kull. "I look forward to working with him in the future," Fishman Romanek told Seidenberg. 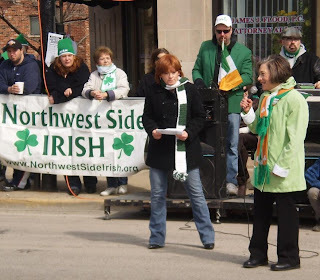 The cancellation of the South Side St. Patrick's Day Parade undoubtedly contributed to the heightened interest paid to this year's Northwest Side Irish Parade. 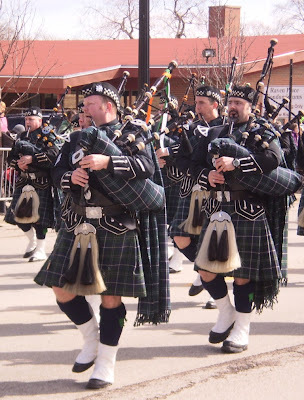 Today was the 8th edition of the parade, which starts at Onahan School and marches down Northwest Highway. 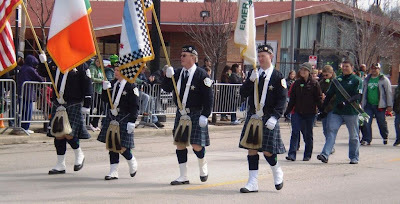 The Chicago Police Department's Emerald Society was prominently featured. 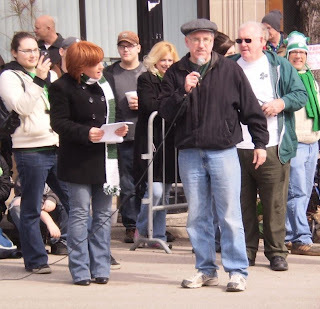 And what would a St. Patrick's Day Parade be without politicians? U.S. Rep. Jan Schakowsky (D-9) paused to greet spectators. So too did 10th Dist. Democratic State Senate Candidate John Mulroe. Mulroe's November opponent for that State Senate seat, 41st Ald. Brian Doherty (at left in this photo), also walked the route. But there was more to today's parade than electioneering. 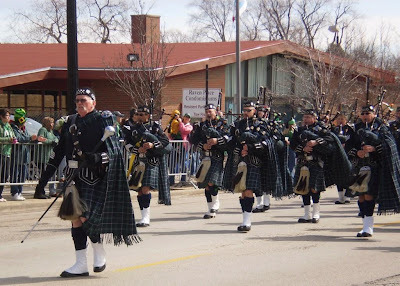 Irish parades need lots of Irish dancers. These are from the Trinity Academy of Irish Dance. For more pictures of today's parade, turn to page two. The Chicago Tribune reports today that the Illinois General Assembly has approved and sent to Governor Quinn for signature a bill that will move the Illinois primary back to the third Tuesday in March. For those newly arrived from Mars, the Illinois primary was moved to the first Tuesday in February in 2008 to enhance the electoral prospects of Barack Obama. With Mr. Obama safely in the White House, the early primary date is no longer needed. Any Supreme, Appellate or Circuit Judge who has been elected to that office and who seeks to be retained in that office under subsection (d) of Section 12 of Article VI of the Constitution shall file a declaration of candidacy to succeed himself in the office of the Secretary of State not less than 6 months on or before the first Monday in December before the general election preceding the expiration of his term of office. With this change, incumbent judges get more time to decide whether to seek retention. A judge who chooses to wait until the new deadline to decide against seeking retention would create a fairly long-term vacancy for the Supreme Court to fill. As a practical matter, though, will this really result in significantly more -- and longer -- interim vacancies? The Illinois Supreme Court has appointed CTA attorney Arthur P. Wheatley to the bench, filling a 7th Subcircuit vacancy created by the retirement of Judge Amanda Toney. An attorney since 1983, Wheatley was chair of the Cook County Bar Association's judicial evaluation committee in 1996 and 1997. Wheatley's appointment was effective March 5 and terminates on December 3, 2012. Updated and corrected 7/8/11. Hat Tip to "Anonymous."